The Columbus Day weekend is upon us, and in New England, this often means an exodus from our cities and suburbs to rural communities in search of a dazzling display of fall foliage color. This year, the weather and the colors are both on par with one another for the holiday weekend: not terrible, but not spectacular. Let’s start with the weather: a weakening cold front will first stall near New England Friday, then return north as a warm front Saturday, then waver around Sunday and Monday. The long story made short is a battle of cool air and warm air will be playing out directly over New England this weekend, meaning variable clouds and an elevated chance of showers each time a strong enough upper level disturbance moves overhead. At first, this won’t mean much, because the disturbances aloft won’t be very energetic – a 30 percent chance of a Friday afternoon shower and a 30 percent chance of a shower Saturday in Northern/Western New England (mostly dry elsewhere) – but later in the weekend, stronger disturbances will make showers more likely later Sunday and rain is likely to approach on Columbus Day Monday. So, all things considered, our best weather to enjoy foliage and other outdoor activities like the myriad of fairs and festivals across New England will be Friday, Saturday and probably the first half of Sunday. What kind of foliage colors will be on display this weekend? This season has surely been less than stellar – thankfully, in New England you can have a sub-par year of color and still enjoy a marvelous display of color, though this year will not be among our more brilliant or intense bursts of color. Rather, we can liken the color of this season to a slow burn – muted by the stress on area trees. After years of dry conditions, capped by the extreme drought of last summer, rains finally came to New England. Although the rain has been a welcome boost to our water table, a wet pattern marks a dramatic and rather sudden shift in the weather pattern, and dramatic changes in weather patterns – particularly when it comes to water – put stress on trees, and can lead to abnormal cycles of seeding and water management, altering the normal progression of foliage color. The complicating factors don’t stop at water – mild temperatures have lingered deep into fall, which has delayed the process for some trees. This morning, my teammate, NBC Boston/necn Meteorologist Tim Kelley, spoke with Peter Wild, founder and CEO of Arborjet, Inc. Wild advises anthracnose and tar spot have been two other major culprits in muting our autumn color. Anthracnose is caused by a fungus and grows best in relatively wet conditions with temperatures of 75-85 degrees. Tar spot impacts maple trees and generally isn’t a health threat for trees, but certainly impacts the leaves with black spots and leads to early leaf drop, which many of us have seen on our maples. All told, this autumn’s colors in New England will feature a notable absence of some maple oranges and reds. This makes our 2017 dominant colors yellow from birch and poplar, bronze from hickories and red/brown from oak. All of this, taken together, combines for a lovely display … just not the dazzling explosion of colors we’re used to – instead, a display heavily weighted toward yellow and brown. 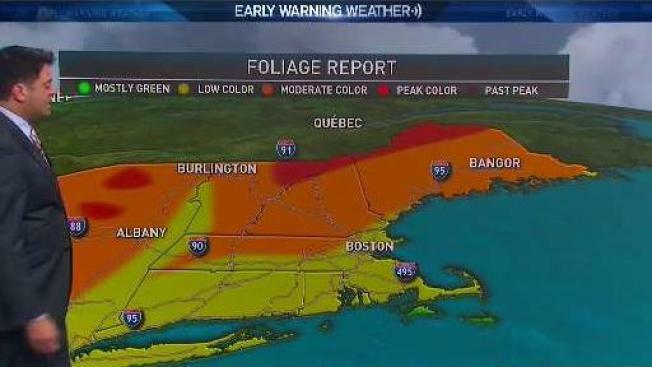 Nonetheless, we know this won’t stop most New Englanders from venturing into our mountains, hills, fields and forests to enjoy the color, and whether it’s this Columbus Day weekend or the following weekends that will bring peak color farther south through New England, we’ll be here to help guide your plans with the forecast and updated foliage report. Thanks to all of our viewers – both NBC Boston and especially New England-wide NECN – who continue to feed us regular photo and written updates on color from your neighborhoods. You can submit photos through our station mobile apps, or email our entire weather team directly at weather@necn.com.